Some Cedarville, Ark., parents are upset after learning that a group of second-graders were shown a Martin Luther King Jr. parody video that used the racial slur "n—ger" some 14 times. 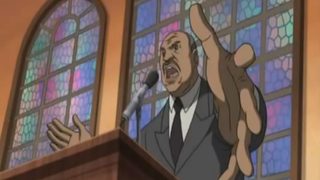 However, Cedarville school administrators say that isn't true and that the actual video shown, less offensive yet still highly inappropriate for children, was Adult Swim's "Boondocks Martin Luther King Speech," "which includes a Martin Luther King figure lecturing 'n—gers' " and uses the n-word some 14 times, according to the news station. "It's the ugliest word in the English language, but that’s what I see now: n—gers," the King character says. "And you don’t want to be a n—ger, because n—gers are living contradictions. N—gers are full of unfulfilled ambitions, n—gers wax and wane, n—gers love to complain, n—gers love to hear themselves talk but hate to explain." Cedarville school administrators told the news station that schoolteacher Lynn Schumacher showed the video to the children by accident and was unaware of the language contained in it, and that she stopped the video once she realized it was inappropriate. Several other parents told the news station that the Charlie Brown video was the one played to the class, but the superintendent, Dan Foreman, strongly denies their allegations. While outside videos are supposed to be shown to the school's principal for approval before they can be shown to classes, Foreman admits that Schumacher did not get approval before showing the video to her class, but he contends that she didn't believe she was doing anything wrong. Foreman told administrators that an investigation into exactly what took place is ongoing, and that includes whether or not Schumacher should be disciplined. Read more at KFSM 5News.